New Security & Collaboration Features for MDaemon 17.5! Our continued focus to make email safe and simple to use has resulted in some great new features in the most recent release of MDaemon 17.5. We’ve highlighted some of the features for email administrators and end users below. So, let’s have a closer look. Many email administrators want an easy way to block connections from specific countries that send spam and malware. New country screening settings allow administrators to block incoming SMTP, POP, and IMAP connections from designated countries. This benefits businesses by allowing them to block messages from countries with which they do not do business, and provides an extra layer of spam protection when certain countries are known sources of spam. 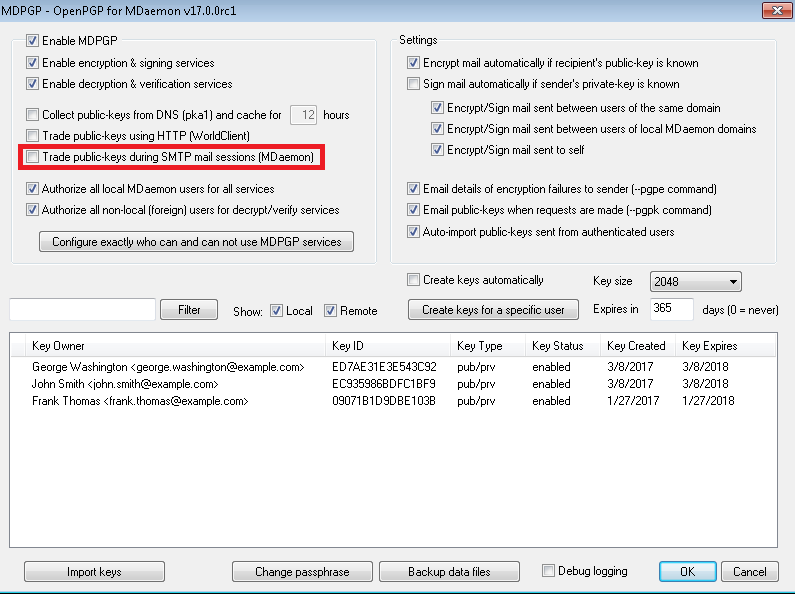 MDaemon’s new Dynamic Screening features can be configured to track authentication failures for all protocols, including SMTP, POP, IMAP, WorldClient, and ActiveSync (among others). After receiving a specified number of failed authentication attempts from a given IP address in a designated period of time, subsequent connections from the IP are blocked for a specified period of time. This helps prevent further connection attempts and password guessing by hackers & spammers. If you’re looking for the previous dynamic screening settings, they are still located under the Security Settings screen, but this screen has been renamed to SMTP Screen. 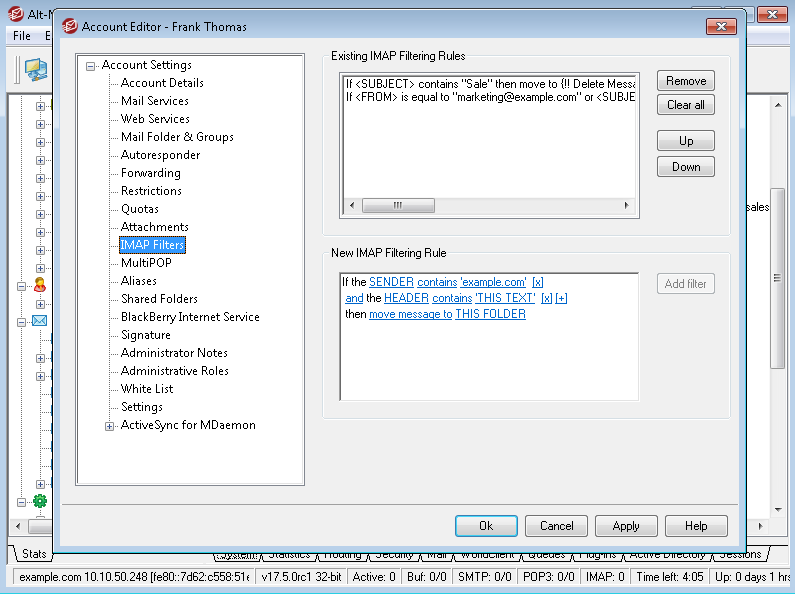 Administrators can set multiple IMAP filtering parameters based on the message size or the contents of any message header, and perform actions such as moving, deleting, forwarding, or redirecting the message. An option has been added that allows the process of exchanging public keys for OpenPGP to take place during the SMTP message delivery process. When this feature is enabled, authorized users will no longer need to manually send their public key to another user from whom they wish to receive encrypted email. 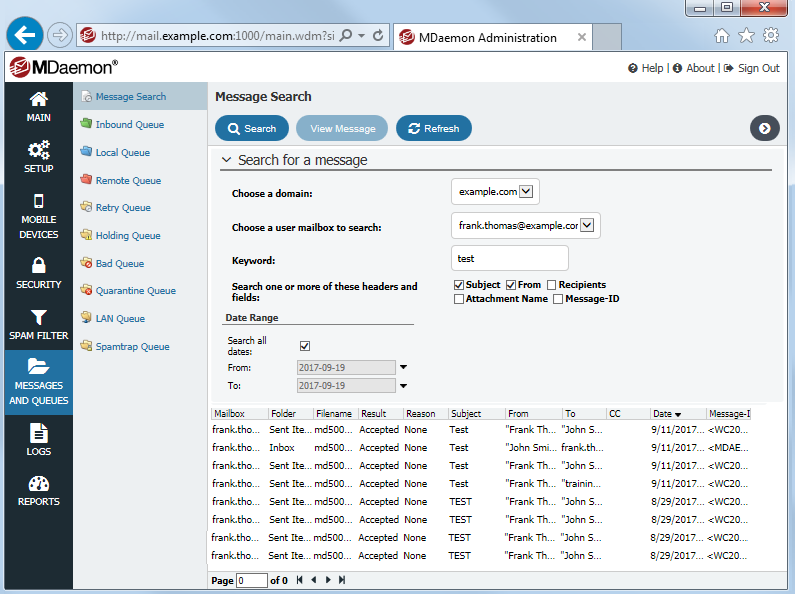 A new Message Search page has been added to MDaemon Remote Administration, allowing administrators to search a single user’s messages based on keywords in the sender, recipient, subject, or attachment name. Searches can be performed on all messages, or only messages within a specified date range. Improved search filters have been added to MDaemon’s web-based email (WorldClient) allowing users to specify filtering rules based on the message size or any message header. Message results based upon the filter criteria can be moved to another folder, deleted, forwarded, or redirected. WorldClient Instant Messenger users can now arrange their buddy lists into custom groups. Attachments can now be added to calendar items, contacts, tasks, and notes via WorldClient, Outlook (using Outlook Connector) or your favorite CalDAV or CardDAV client. 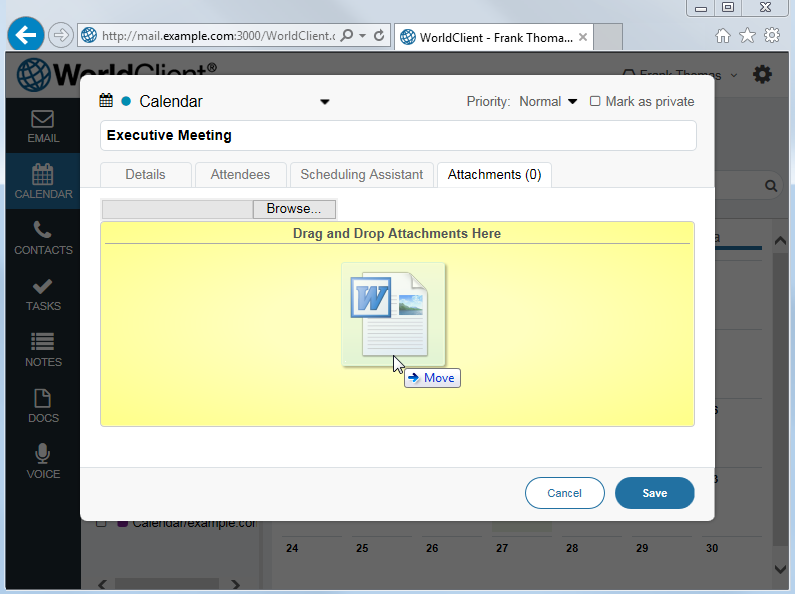 When scheduling a meeting, attachments added to calendar events will be sent to all meeting attendees. 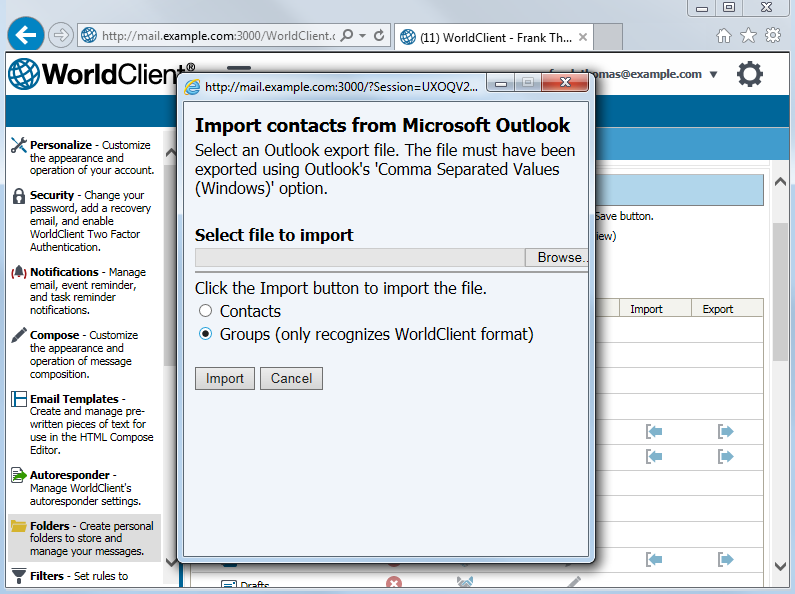 WorldClient users can now import and export groups/distribution lists to & from their Contacts folders. The ability to import groups allows users to avoid the extra steps needed to add group members individually. 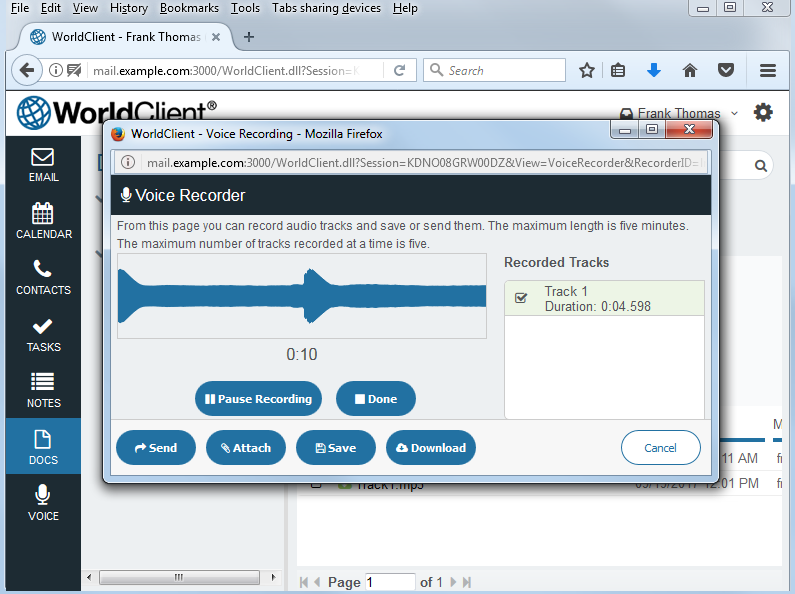 WorldClient’s new voice recorder allows users to record voice memos and attach them to email messages, save them to their WorldClient Documents folder, or save them to the desktop. Move folders from one parent folder to another via drag & drop. Add folders to Favorites via drag & drop. Rename folders in the Favorites list by clicking on the folder name. 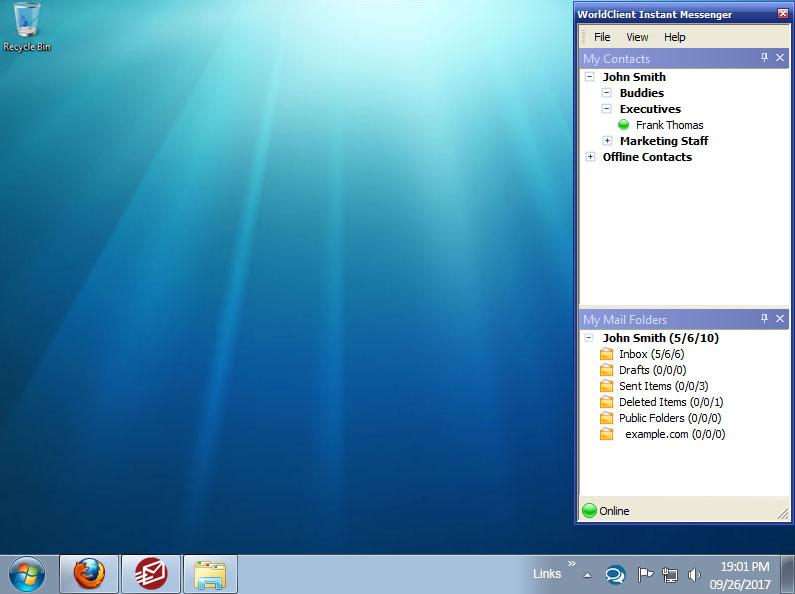 Show folders by type in the LookOut theme (previously only available in the WorldClient theme). 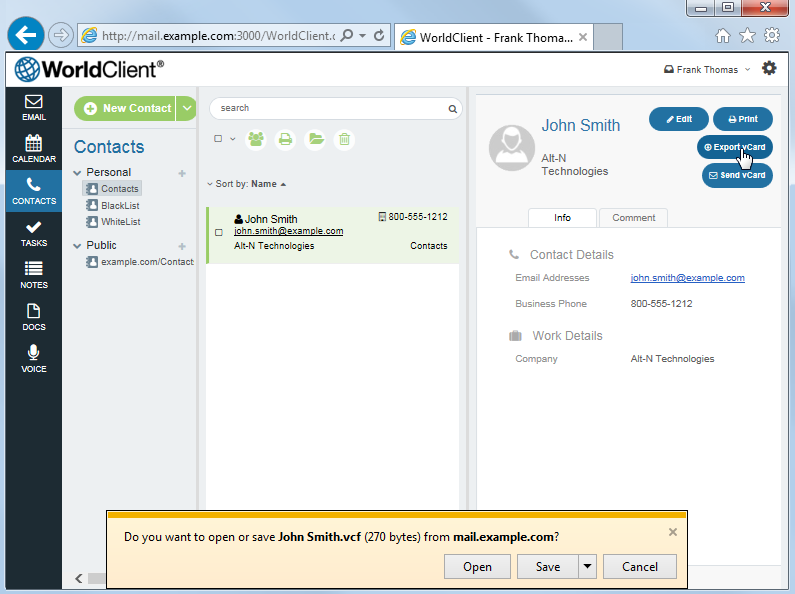 WorldClient users can now export individual contacts in VCard format, a file format standard for electronic business cards supported by a wide variety of email clients. VCards contain various details about a contact, including name, company name, email address, postal address, phone number, and additional comments. They can be downloaded locally or sent to a designated email address, and then imported into any email client that supports the VCard format. 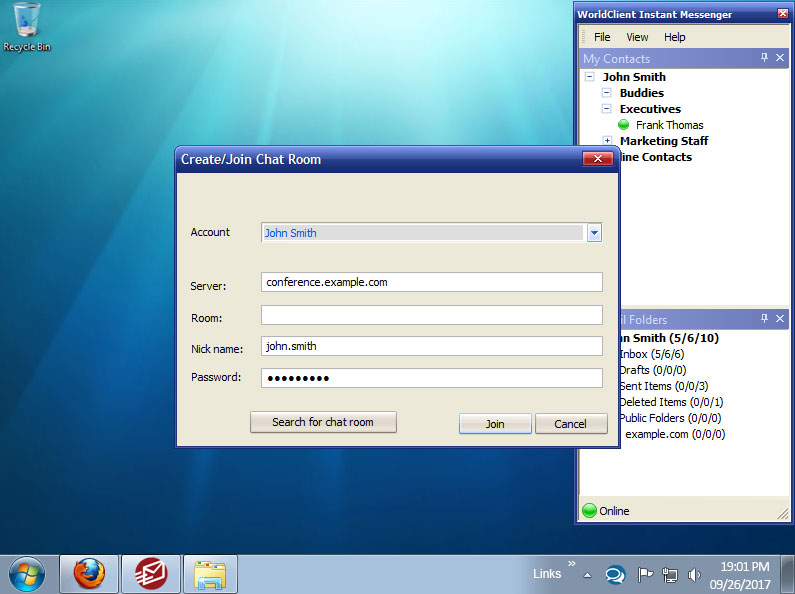 For added security, WorldClient Instant Messenger users can now chat with others via password protected chat rooms. When creating a new chat room via the WorldClient Instant Messenger application, simply enter the password that is required to join in the new Password field. By default, messages that cannot be scanned by SecurityPlus are quarantined. The antivirus quarantine exclusion settings have been improved. In previous versions, administrators could configure exclusions from antivirus scanning based on attachment file type. Now, administrators can also configure antivirus scanning exclusions based on the sender or recipient address. 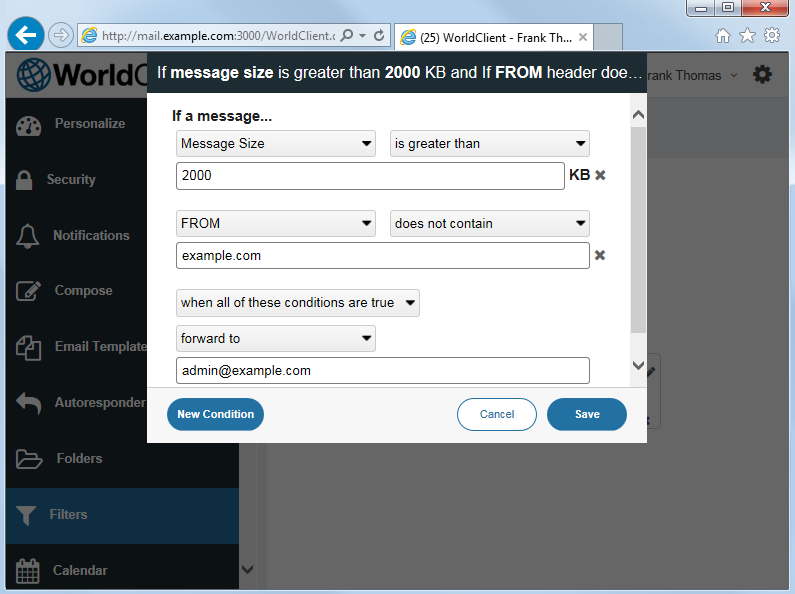 When using the WorldClient theme, the look of WorldClient Notes has been updated. An option was added that allows users to change the color of the note by clicking on the note icon in the top left corner of the note. 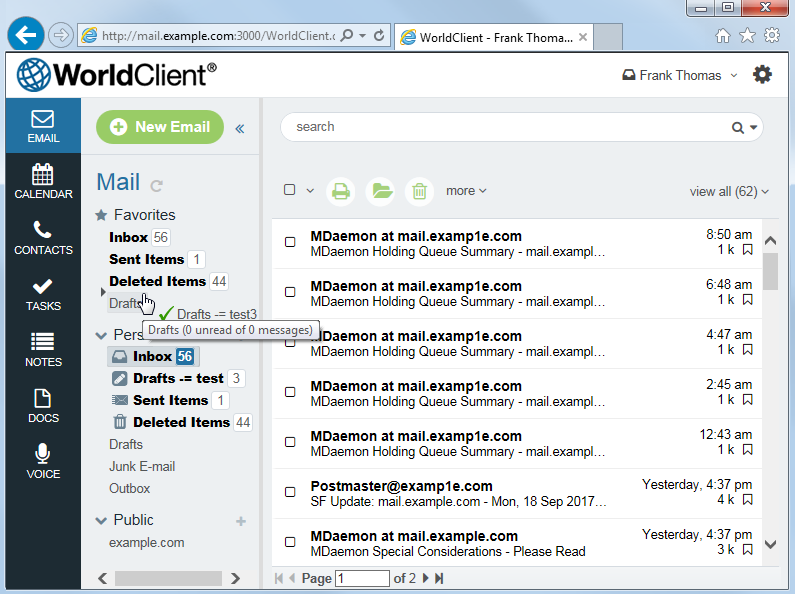 When using the LookOut and WorldClient themes, WorldClient users can now search for attachment names using advanced search. If you’ve got questions or comments, let us know via the Comments link below!